While the idea of utilizing garbage as a power source is nothing new – think Doc Brown's DeLorean in Back to the Future – efficiently creating liquid fuel from common wastes would represent a big step forward. 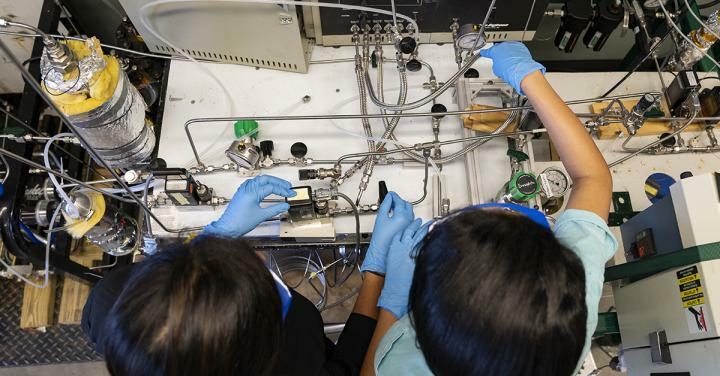 "There are many ways to take biomass and convert that to energy forms," said USF Professor Babu Joseph, PhD, in the Department of Chemical and Biomedical Engineering. "The most popular form right now is to burn the waste and produce heat. Then use the heat to produce electricity. But what we're trying to do is to make liquid fuels out of this biomass that can be used anywhere for anything." Joseph, along with Associate Professor John Kuhn, PhD, the project's principal investigator, are leading this research effort at USF. The pair were recently awarded a $1.8 million grant by the U.S. Department of Energy (DOE) to further their past work in the field. The grant is part of a DOE research and development initiative aimed at improving bioenergy technologies. Its overall goal is to reduce the cost of bio-based fuels, making them a more economically viable alternative for consumers. USF's biogas conversion research is one of the projects showing promise in reaching this goal while also utilizing an available resource. According to the DOE, roughly one billion tons of biomass is produced annually, providing a renewable supply they say could replace roughly 30 percent of the petroleum consumption in the U.S.
For Joseph and Kuhn, the trick is developing a more efficient conversion process. Currently, researchers use a specially designed catalyst to reform the methane/CO2 gas into carbon monoxide. Then, they're able to use a separate catalyst to convert the carbon monoxide into diesel fuel. "Presently, both steps require individual catalysts," said Kuhn. "But, thanks to support from this grant, we're trying to combine the two to accomplish both steps through a single process, making the entire method more efficient and feasible to be scaled up."